WPEngine is one of the best hosts out there for WordPress sites: I have two of my own on their service. Focused on WordPress and the infrastructure required, they make keeping up with all the updates and security patches easy. But, like most hosting services, the company does expect that you have a basic technical understanding of the software and its requirements. Not everyone has that, and for some people who are happily blogging, PHP might well stand for Personal Habitat Preference or Purple Hibiscus, Peony or… something else equally unlikely and non-technical. Suffice to say, with a modern WordPress site, you really need to have PHP working and secure. Which is why WPEngine is pushing everyone to PHP 7.2; to improve performance and to tighten down security both. As you can see from the button, WPE does have an upgrade guide, but let me step you through the process I used for upgrading my GoFatherhood parenting site, which is hosted on WPEngine. Ah, in fact, I had forgotten, I’ve already upgraded GoFatherhood to PHP 7.2. It’s IntuitiveStories.com that I need to move from PHP 7.0 to PHP 7.2, as the red alert indicates. As shown, I suggest that you choose “PHP 7.2” to test against and specify only the plugins and themes that are active. I will note, however, that from a security perspective, getting rid of unused plugins is a lot smarter than just deactivating them. Hopefully you’re already familiar with the many options on that menu, actually! The next step is easy but not obvious: Click on the “7.0” adjacent to the red PHP Version information. 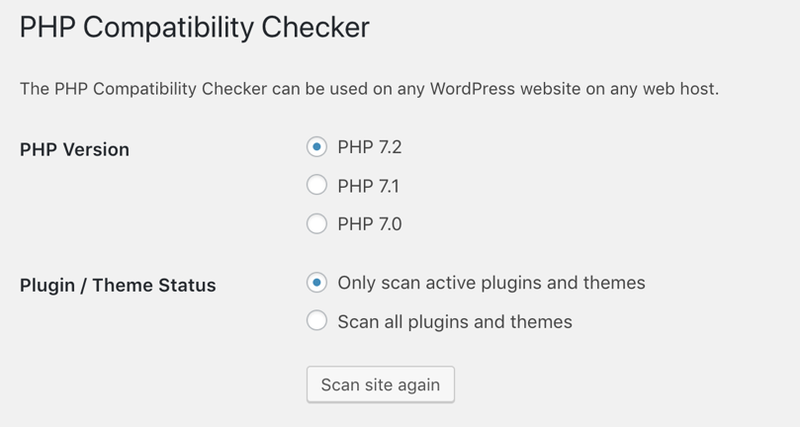 Check the circle adjacent to “7.2” and… click on “Change PHP Version“. Note: if this seems daunting, WPEngine offers assistance on the upgrade process for a nominal fee. Please check with their customer service team for details. Pro Tip: Learning about WordPress? Excellent! We have lots of WordPress help on the site, please check it out!